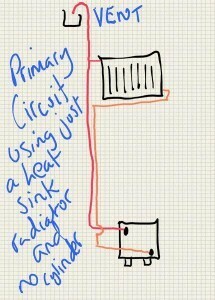 I mentioned earlier that the primary circuit will eventually heat up the water in the cylinder. Cylinders are insulated so the heat cannot escape. After some time the water in the cylinder will be close to the same temperature as the water in the primary circuit. At this stage the gravity circulation slows down (hot water will not rise through hot water). If it slows enough then the stove can boil. Boiling is not inherently dangerous if the system has a vent (if no vent then the stove or the circuit will explode). However, boiling is noisy and certainly not acceptable (should you ever experience a boiling system then run any hot taps as this cools the water in the cylinder and also cools the coil and subsequently the primary circuit). Excellent method of piping a heat sink radiator as the radiator will self-vent any air (air in the rad will swiftly prevent it working). So what we must do is add a radiator TO THE PRIMARY CIRCUIT. Radiators are not insulated and therefore they leak heat to the room they are in (hence they can be called a heat leak radiator rather than a heat sink radiator). 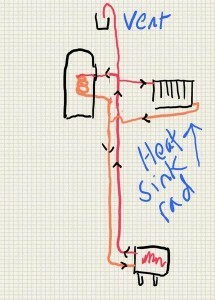 The idea is that the radiator will always lose some heat and will therefore always be cooler than the water in the flow pipe and therefore the hot water from the flow pipe “falls through the radiator” and the primary circuit will never actually stop flowing. The bigger the radiator the more heat it loses and therefore the more effective it is at keeping the primary circuit speeding along. A heat sink radiator should be at least 10% of the KW output of the “maximum output to water” of the stove (more if the stove manual says so and I have seen figures as high as 20%). So if the stove has a maximum output of 10KW to water then the heat sink radiator must be a minimum 1KW. Heat sink radiators are also desirable as they prevent thermostatically controlled boiler stoves “shutting down because of overheated water” (people in the room where the stove is might be cold and unhappy because the stove has shut down – all because the radiators, in other rooms, are too hot). Note that a heat sink radiator is always on when the stove is lit and for quite a while after a fire dies and so is best in a room where this heat can be used. Bathrooms are ideal as towels can be dried. Bedrooms are not good as the radiator can be on for quite a while after the occupants go to bed (room gets too hot). Landings are good. Of course, due to pipework considerations you may not have a lot of choice (where the heat sink rad goes is often the most difficult issue I face when designing a wet system). For a heat sink radiator to perform correctly it must be sized and plumbed in correctly. As suggested earlier the primary circuit will likely be in 28mm copper pipe. The pipe to the heat sink radiator from the primary circuit should be 22mm, although 15mm can be used in the last 30cm close to the radiator. There can be no valves of any kind on the radiator (I use brass compression fittings male 1/2″ bsp thread to 15mm compression). The plumbing is TBOE Top Bottom Opposite Ends. In other words the FLOW goes into the top whilst the RETURN goes into the opposite bottom corner. The above picture shows pipes from the stove travelling up the right hand side of the chimney breast. 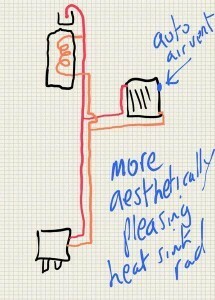 The two pipes branching off close to horizontal head through a wall and into a heat sink radiator on the opposite side of the wall. For those interested the pipes travelling up into the attic are two pumped radiator pipes and one vent pipe (no cylinder on this job). Above is the heat sink radiator on the other side of that wall. 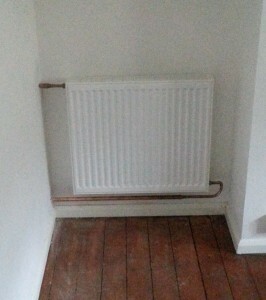 Note the 22mm pipe changing to 15mm close to the radiator. Above is a slightly more aesthetically pleasing version of the heat sink radiator but it will not self vent air. I will always fit the automatic air vent but not all plumbers do. Note that if a heat sink radiator gets air in it (they can and I will discuss this in another article) it will stop functioning as there will be no circuit of water passing through it. Instead of an auto-air-vent (top right hole on rad on above picture) one can fit a 15mm copper pipe that loops over the header tank like a hockey stick. If you have a large boiler stove and do not wish to have the large heat sink radiator required there is nothing to stop you having two or even three separate heat sink radiators. The picture below shows a circuit without a cylinder. One can have just a heat sink radiator as long as it is the correct size.